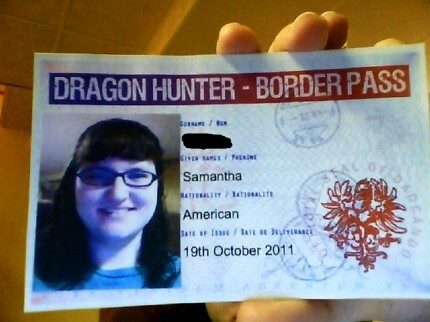 A modern recreation of Kaptin Scarlet’s forged Dragon Hunter’s Border Pass. 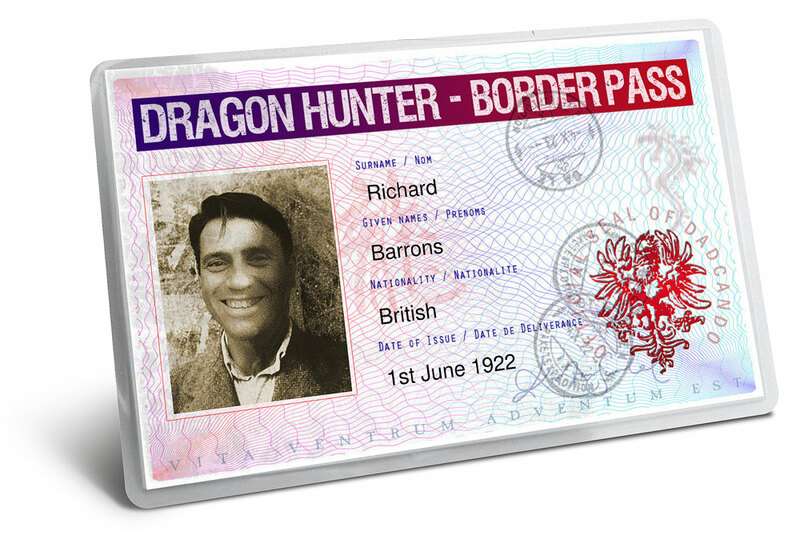 Under the cover of the name, Richard Barons (his family name), and this pass, Kaptin Scarlet successfully crossed the Tibet – Nepal border to study Chinese Lung on the Qinghai-Tibetan Plateau, but was later arrested and deported when locals tipped off the police after they suspected he was not hunting dragons, but trying to save them. n 1922 the World was preoccupied with thoughts of all things dark and mythical as Friedrich Murna’s Dracula film, Nosferatu was released and premiered in Berlin. Central Europe was quickly becoming the new Dark Continent and story tellers revelled in the idea that strange and frightening beasts could be lurking so close to home. What little they knew! Even as they talked about vampires, healthy populations of Wyvern and Slimy Greenback hid in the heart of the Black Forest until the late 1950s; still, that is another story. 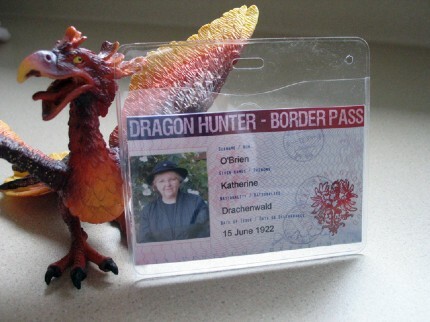 In the 1920s and 1930s I didn’t travel much to Central Europe on dragon business because after the First World War I stopped dragon hunting, choosing instead to employ the considerable Barons’ fortune to the more philanthropic ends of Dragon Conservation, an activity which in those days, was not needed in Europe. So it was in the late spring of 1922, while Europe obsessed itself with the legend of the (entirely fictional) vampire, that I travelled to one of the remotest parts of Tibet in the hope of finding any sign that the beautiful Chinese Lung had not finally become extinct.
. . . At that time, despite a worldwide treaty banning the destruction of dragons and their habitat, it was often the case that the endangered creatures were hunted and killed for sport in the more remote regions where the local law enforcement not only turned a blind eye to the practice, but often supplied weapons and guides in return for payment. Such was the money to be made from the organised dragon hunts that conservationists, like myself, were not welcome.
. . . Towards the end of April I travelled to Ngari, the highest point on the Qinghai-Tibetan Plateau, with the hope of locating and studying what I thought to be the last example of a wild Chinese Lung living in Tibet. 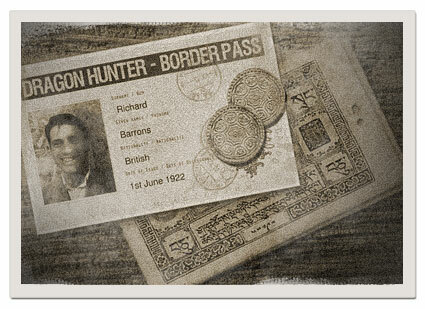 However, before leaving England I had discovered, through one of my contacts, that free movement around Northern India and Tibet was being restricted to all travellers and only those that held valid dragon hunters’ passes were being given access to the remotest parts of the interior. 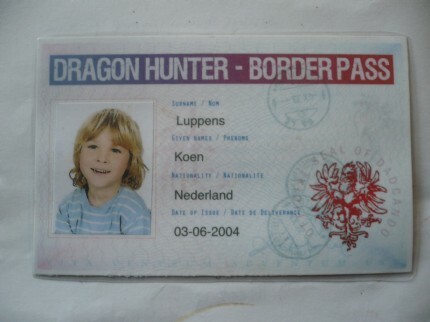 Although my hunter’s pass had lapsed a few years before, I was confident of gaining entry to the land because the lengthy boat journey promised me plenty of time to forge my own more up to date Hunter Pass. In the end, the effort was to be wasted. 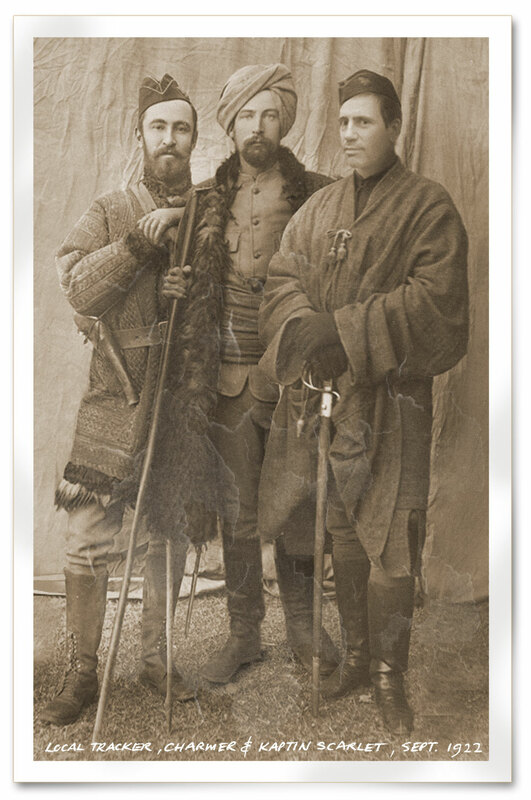 Despite dressing in the traditional dragon hunter’s garb and hiring both a Dragon Tracker and a Charmer, three weeks into the trip and on only the second day at the plateau, I was arrested and deported on suspicion of being a conservationalist. Of course the pass itself was confiscated and I felt lucky to escape without a jail sentence. Now the only evidence that remains from the trip are the two photographs I'm showing you here. It's funny though how things have a habit of working themselves out, because it was only a decade later that I was pardoned and given an open invitation to return to continue my conservation work, although by then it was all but too late to save the Lung from becoming extinct. Kaptin Scarlet (right) travelling under the name of Sir Richard Barons dressed in traditional Dragon Hunting grab, poses with a local Dragon Tracker (left) and Dragon Charmer, 1st Class (middle). 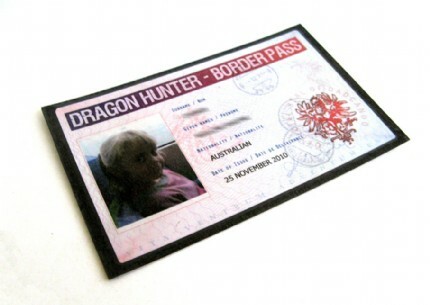 After finding the photograph of the fake Dragon hunter’s pass I thought you might like to make one for yourself. With the special dynamic forms I have been developing, the pass making process should certainly be easier for you than it was for me, on a pitching ship, in the middle of the Indian Ocean with only the most rudimentary graphic equipment at hand. Last known photograph of the Dragon Hunter’s Pass, complete with bribe money needed to pass across the border. Download the pdf you require, (either A4 or US Letter size). The pdf includes a form for your own personal information, and this will allow you to type in your name, nationality and the pass’s date of issue. 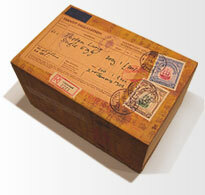 The pdf has four form areas on it which you can fill in with your own details. Hover over the areas of the form under the detail headings and type in your details. When you have filled them in, for security reasons you will not be able to save the form, but you can print it out ready for the next stage in the pass making process. Stick a passport sized photograph in the space provided. You can use any photograph of yourself printed on your inkjet printer and trimmed to 3.5cm x 4.5cm, or you can use a real passport photo, if you have one handy. Cut the sheet in half between the back and the front of the pass. Stick the front and the back together so that they line up. This is much easier if you hold them up to a window so that you can see through the paper. 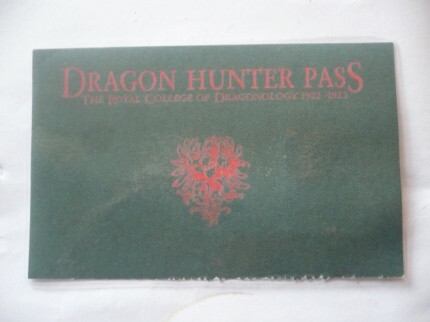 You’ll notice that the back of the pass is slightly bigger than the front, this is so that when you cut out the pass the black printing will go right up to the edge. You can use scissors or a craft knife and ruler if you want a really neat edge, but take care. You can use your pass as it is, but for a much better finish, laminate the pass in clear plastic. 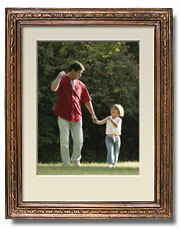 You can do this using book-covering, clear sticky backed plastic or better still, hot lamination. Hot laminaters for home use are very inexpensive and make great craft tools, but if you don’t want to buy one, your local copy shop, high street printer or library should be able to laminate single items for you very cheaply. Posted by nepenthe - I used a desktop publishing program to alter the border pass so that I could add the picture before printing it out. Posted by caitriona - I chose to put mine in a badge holder rather than laminate it. Oh, and that's a Phoenix rather than a dragon but I don't have dragon's around the house! Here you'll find so much more than dragons; you'll find projects that make it possible to create fantastic stories and games of your own. Every project is totally original and explained with simple illustrated downloads so that you can do the project together or (depending on age) your child can do it on their own, with a little help from you at key stages, and make something that really looks gorgeous. 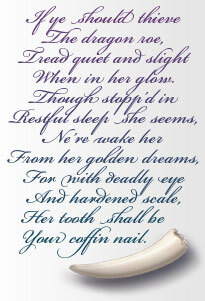 So set your imagination alight with our wonderful dragons projects. 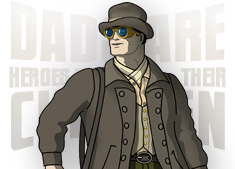 Follow the story of Kaptin Scarlet, the famous philanthropist, whose 19th Century adventuring to bring back numerous weird and wonderful artifacts was the delight and fascination of civilized Victorian society. 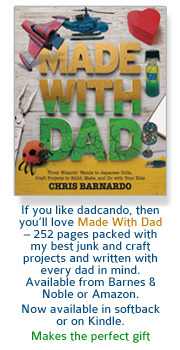 His motto, Life is Your Adventure, is as true now as it ever was, and is perfect for kids and dads everywhere, so make it yours and make the most of the time you spend together.